Far Home Bernabeu i Madrid, Spania: Bestill nå! Far Home Bernabéu is a brand new hostel with elegant and modern design, air conditioning in every room, free Wi-Fi, terrace, common area and work stations. 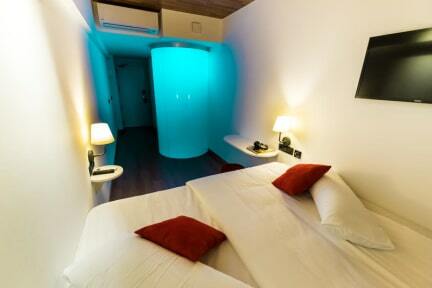 Far Home Bernabéu offers a variety of private rooms and single beds in shared rooms. We are the perfect match to discover and enjoy Madrid and Spain. Located at Calle de las Mercedes, in the financial district of Madrid, just 10 minutes away from the Santiago Bernabeu Stadium and 2 minutes away from Estrecho subway station. We are near to some of the finest attractions and landmarks of the city such as Mahatma Gandhi Memorial, Tiflológico Museum (ONCE), Santiago Bernabéu Stadium and Museo Geominero, amongst other interesting spots in our city. Far Home Bernabéu offers a variety of private rooms and dorms, all of them with several capacities. 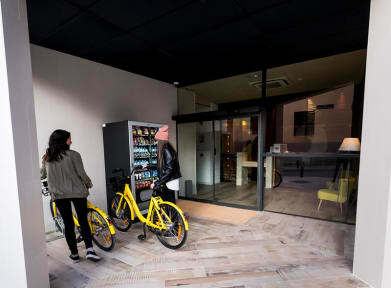 The modern rooms have free WI-FI connection, desk, individual lockers or closets, air conditioning and a private or shared bathroom depending on the type of room, some of them have a terrace perfect for enjoying Madrid's nightlights. Lockers needs padlocks. You could bring your own or you could buy at reception for 5€. Towels for rent are available for 2€.